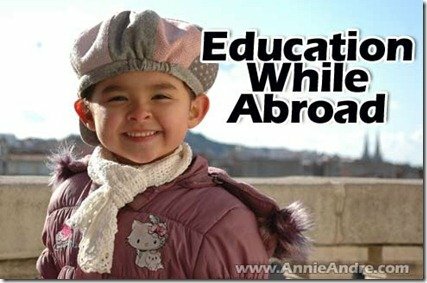 One of the problems when people travel long term or live abroad is how to educate and keep your kids on track with the rest of their schoolmates back in your home country. We chose to mainstream our kids in public French school while in France. But what if you don’t want to be tied to a school schedule and travel to more than one country in any given year? What if you want to do an around the world trip with your kids? Simple, you can always homeschool while travelling. Today’s article is a guest post written by Susie Brown. Her article is a great introduction into the world of homeschooling while travelling or living abroad with kids. It’s hard but not as hard as people think. As Susie puts it, “if she can do it, anyone can”. Take it away Susie. When my oldest son was having trouble keeping up in school we considered all of our options. And after checking into everything that the school system had to offer us, we weren’t very impressed. It seemed that our son was doomed to fall through the cracks of the education system and there was nothing we could do about it. We decided to try homeschooling, mostly because we figured that it couldn’t be any worse than the other options. After a few weeks of homeschooling our sons face began to shine again, he was a much happier boy, and we witnessed how his mind was able to develop in ways that it didn’t while he was in school. It turns out that the school atmosphere just wasn’t right for him. Eventually, our other kids wanted to try homeschooling too, and that was the beginning of our homeschooling family adventure. As it turned out, one of the greatest perks of homeschooling is being on a different schedule as everybody else. When the zoos, museums, and other fun outing destinations are flooded with people on weekends and holidays we avoid going, because we can go on school days in order to avoid the lines and the crowds. And when we moved we didn’t need to look for new schools, nor did we need to worry about our children’s curriculum changing. For anyone who is considering relocating for a limited time, homeschooling might be a great option. But if you plan to send your kids back to the same school system, you will obviously need to keep them up to speed. Thankfully, many homeschooling families find that their children are able to learn the material a lot faster than their in-school peers. The first step towards staying on track with the school is by asking the school. Go to the school where your child would otherwise be attending and explain to them your travel plans and your plans to return. That is show them that you consider them too as important educators in the life of your child, which is a very engaging and gratifying feeling for teachers. After explaining your travel plans, ask them for a general idea of the curriculum. The teachers should be able to give you a general answer. Although, teachers do improvise and readjust their lesson plans throughout the course of the school year, they are required to cover certain material. Once you find out what that required material is, you can make your own lesson plan of how to learn it. By the way, planning your own curriculum might seem like a daunting undertaking, but it’s not as difficult as you might think. I have no formal training in being an educator, and if I could do it, so can you. Another benefit of being in contact with your child’s school is that the school might be able to give you their own suggestions for what and how to study with your children. I know of a mother who when she told her child’s school of their plans to relocate to Argentina, the school was smart enough to take advantage of the situation. Her child’s grade learned about Argentina’s history and culture, and the mother and school coordinated their curriculums together. When the school learned about the native Argentinean tribes they would go visit the ruins video camera in hand. The school benefited by showing the videos to students, and the family benefited by remaining in sync with the school’s curriculum. How parents go about assuring that their kids are getting the best education possible during the homeschooling process is a matter or trial and error since so much of learning is child specific. I am a big fan of using online learning sites in order to teach important concepts. Online learning sites are often designed in the same way as video games. Similar to the way a child needs to figure out certain things in order to win a video game she will likewise need to figure out how to “win” the online learning games. In the course of playing and winning those games they learn fundamental concepts. Whereas if a student doesn’t understand a concept when they take a test or do homework, which is bad news for their grade and their self-image, with online learning sites they can just try again. Most kids love trying again, just like they like playing video games over again. To get an idea of what I am talking about go to www.ixl.com, a math learning website, where you can try out their features for free. Ideally I don’t recommend using online learning sites as the main component for teaching, but rather as an assistant to your regular learning schedule. My favorite thing about homeschooling is the fact that my kids are completely engaged in their learning. Since there is someone constantly there to help them in their learning (usually that’s me), they never slip into passivity. Learn about the history of your host culture and then go and visit the sites which you learned about. Learn skills that are culture specific like learning Chinese calligraphy in China, or learning how to cook French cuisine in France. Homeschooling exists in most places in the world, and homeschooling families usually make plans to meet up together on a regular basis. Inquire about these homeschool community activities and you may find a community that is happy to accept you with open arms. Homeschoolers, as a general rule, are some of the nicest and most accepting people that you will ever meet. These mini-communities are a great way to make friends and they can be a valuable source of information and networking. When we first started researching the possibility of homeschooling we decided to go right to the experts- the products of homeschooled education. I spoke to a few young adults who had graduated from homeschool high school, and whom I consider to be very successful. I asked them if they had any advice about homeschooling. Their unified response. “Don’t let homeschooling become no-schooling.” Although homeschooling does allow you to be much more flexible in your activities, it is still important to pursue goals and stick to some type of schedule. Author Bio: Susie Brown is a FastUpFront Blog contributor and business author. Fastupfront offers working capital to businesses in need of a loan.